After the submission deadline of November 30th, we have over 300 great proposals to comb through with many coming in at the last minute (thank you for flooding my email inbox). 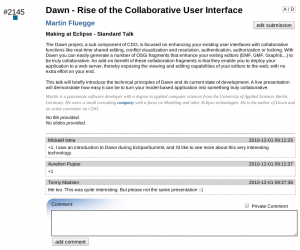 The main goal of the EclipseCon program committee is to create a high-quality and compelling program. To that end, the Program Committee will accept late submissions for the program. However, it is also the goal to have the program mostly selected by December 7 and finalized by December 12. Therefore late submissions are given lower priority unless they are of exceptional quality or fill a gap in the technical program. So the bottom line is yes, you can submit late, but it gets a lower precedence. If you are really looking forward to a talk or are impressed with the speaker, please comment so you have your voice heard. The EclipseCon Program committee looks at each proposal in depth and takes comments from the community inconsideration.